In the latest sign of construction progress for the Metro Orange Line Extension Project, work crews this week poured the deck for the busway’s bridge over the Los Angeles River in Canoga Park. The four-mile busway now being built parallels Canoga Avenue on its own right-of-way and crosses the L.A. River near Vanowen Street between the current Canoga station and the future Sherman Way station. The deck pour was preceded by the contractor’s footing, abutment, and girder placement work that was completed earlier in October. The bridge deck for the Lassen Street bridge was also completed earlier. See Curbed L.A. post on other Orange Line construction work. The L.A. River bridge is one of three bridge crossings that are part of the project. The others are the bridge crossing at the Santa Susana Wash near Parthenia Street and the Lassen Street Bridge that connects the busway directly to the Chatsworth Amtrak/Metrolink station. 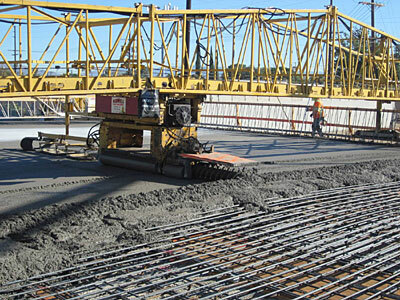 Concrete spreading machine (Bidwell) spreads and smoothes the new concrete for the bridge deck. The bridges are some of the few geographically notable features on an alignment that follows a pretty predictable former railroad right-of-way for most of its four-mile route. In addition to accommodating one busway lane in each direction, both the L.A. River Bridge and Santa Susana bridge also will include the project’s bike and pedestrian path. The bridge at Lassen Street is designed for bus traffic only. The bike/ped path will continue at street-level to Chatsworth station and also connect with the Browns Creek bike path. Random question: Are these bridges being built with the possibility of a future LRT conversion in mind? Nice progress. Just out of curiosity…if eventually a light rail is build on top of the current Orange Line, are any of those bridges built to withstand the weight of the LRTs or will all of them need to be reconstructed? Good question about the bridges. I don’t know the answer–I will try to find out next week. To answer the questions above, all three bridges are built to meet LRT design standards. The bridges will not need to be reconstructed if the Orange Line converts to LRT.